364 The Napinka Subdivision, Mile 0 to Mile 49. 1997/07, CPR Napinka sub. Mile 21, The Clearwater water tower with a new coat of paint and the stack removed. When this photo was taken, this tower was one of 2 remaining wooden CPR water towers in Manitoba, the other one being N. at Glenboro. 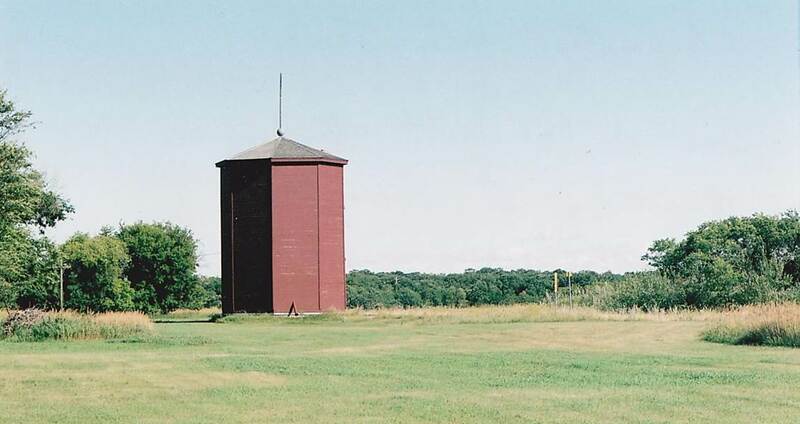 Since that time the Glenboro tower has been vandalized and destroyed by fire, therefore leaving this tower as the only standing CPR water tower in MB. It has been designated a Heritage Site in 1996. View – looking S.E. across Long River Valley. (Information – “Prairie Pride: Looking Back” The Louise History Book Committee, 1998) (Click on photo for detail) © Text and Photos exclusive copyright of N. Froese, Author. This entry was posted in Uncategorized on 2015-06-09 by nfroese.